BJS – Stick That in Your Pipe…. There I was Tuesday afternoon and I get the call to say that there would be no more trailer work that week, so what do you do as an Owner Driver?? Yep you ring around and find some thing to fill the gap. Luckily for me it was some thing a little more interesting. An old contact and a then good friend used to do some work for Williams Transport from Huntingdon. 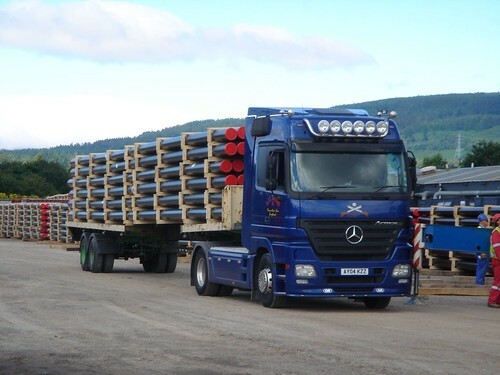 Williams have a contract with a plastic pipe manufacturer and deliver all shapes, colours and sizes all over the UK. 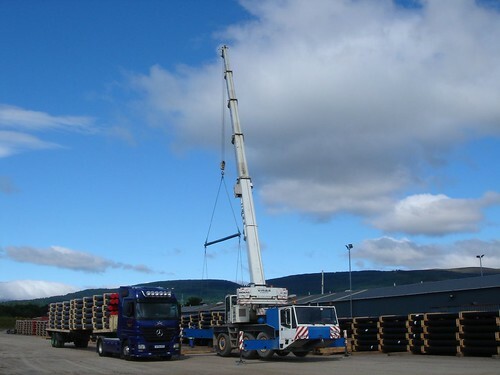 At the time there were endless loads of 60ft pipes to go up to Evanton, just north of Inverness. 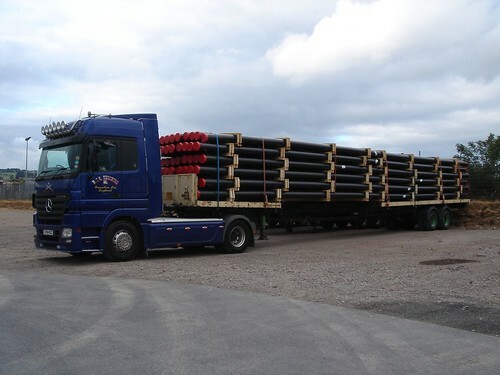 There were to be used to make up 1km long lengths of pipe for the offshore industry. So did I take up the challenge……..of course I did. 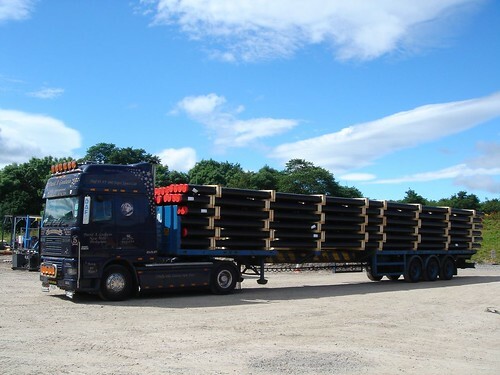 I’d never pulled any thing overlength before so taking a 60ft extended trailer all the way up the A9 to Evanton sounded like good fun, especially with the slightly odd twin axle trailer I was to pull. Now I know it’s not in the same league as what the drivers of my now employers HC Wilson regularly do, but none the less it was still a challenge, which I sucessfully completed. I think the only kerb I clipped was when I first left Wyton Airfield near St Ives, heading for the A14 on Wednesday. 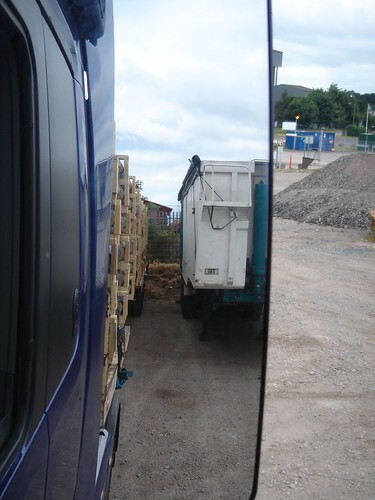 This was the view out of my mirror, as you can see a normal length trailer seems quite short compared to mine. Again I know its not silly big, but trying to get it parked in the busy Penrith Truckstop was interesting. Any way after a good nights sleep I was to meet Pornstar Pete at Carlisle and he would follow me up to Evanton as he had been doing a couple of trips a week so knew the score. The other bonus of being paired up with Pete was, he (in a former life) was a tour bus driver so I was treated to a running commentary all the way up, which I thoroughly enjoyed!! 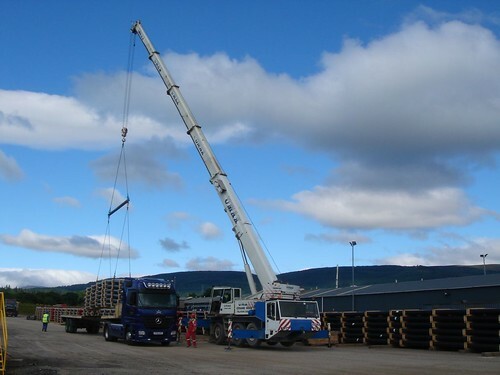 On arrival in a sunny Evanton mid morning on Thurday, I was confronted with a yard full of pipe, an amazing kilometer long stretch of reclaimed land out into the Cromarty Firth filled with already made pipes and a crane to lift off my 2 lifts. If you look on any satelite map you will see the Old Airfield at Evanton has been turned into the pipe works and you’ll see the the man made pipeway out into the water, where the ships back onto and get loaded. Once empty Thursday lunchtime, Pete and I closed up the trailers and headed south. Pete was to run back empty so he could get another load loaded on Friday to head back to Evanton the following Monday. I was to reload from Liverpool or Runcorn some where like that with a load of ladders asap on Friday for 3 drops Friday afternoon to Kimbolton, Cambridge and Bury St Edmunds, no mean feat I tell you. Collect trailer from St Ives, Cambs Wednesday Morning, Tip Evanton Thursday AM, reload Merseyside Friday asap, 3 drops East Anglia Friday PM………..Mission accomplished, thanks to Claudia my trusty Actros. Purely because I didn’t have time, I have no photo of the ladder load and I also can’t remember where exactly I loaded them from. They were all orange in colour and I’m sure it was Merseyside, can you tell me where it was??? email ben@truckblog.co.uk and jog my memory! For the record, this is Pornstar Pete The Tour Guide’s DAF, with Williams Transport owned ex CPL trailer! This entry was posted in BJS, Mercedes Benz, Photos by truckbloguk. Bookmark the permalink.